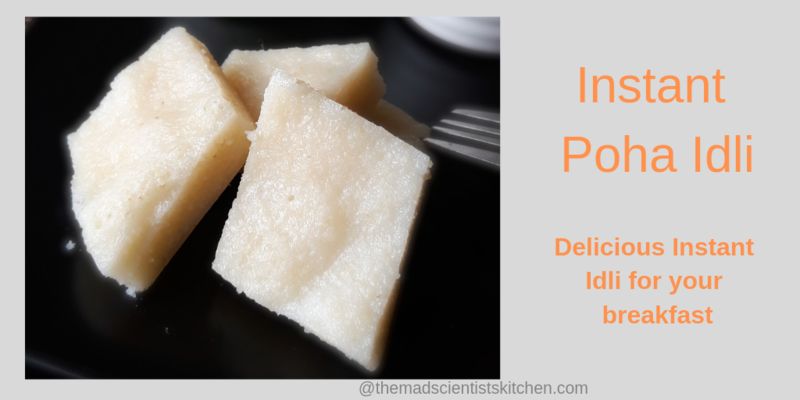 Instant Poha Idlis are soft, delicious, and the best part is instant. 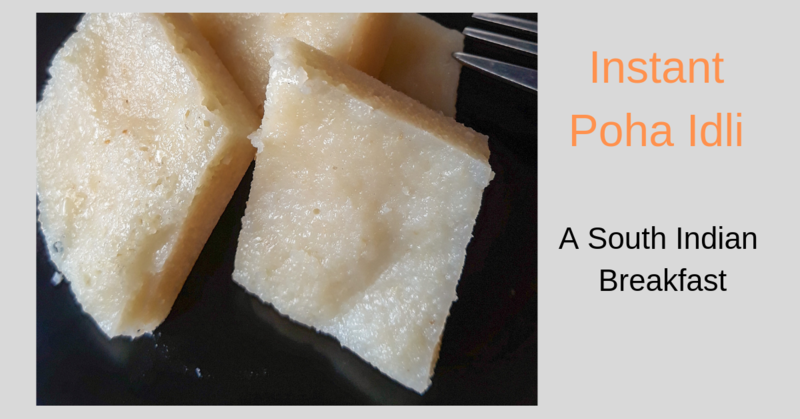 If you are like me wondering at the crack of dawn what to make for breakfast before what feels like the hungry horde descends on you then look no further make soft poha idli. Idlis are a common feature in my household. So much that Apeksha, my elder daughter, refuses breakfast. The other one mindlessly follows her sister. Husband and father-in-law are idli fans but do not care much about me “messing around” with idlis. Hubby favourite idli is Butter Idli, and the most difficult to make as it is temperamental. Then he loves the regular idli. 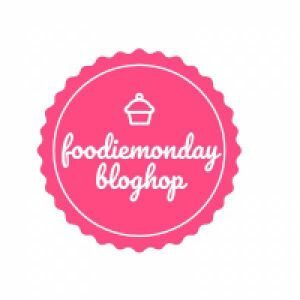 So this Monday it is Mayuri’s turn to decide on themes for FoodieMondayBlogHop. Today happens to be our #188 Idly Medley. Mayuri suggested we make idlis without rice the concession we had was we can use dal. Knowing Mayuri I know she will dish out amazingly delicious idli with a beautiful photograph to go with it. Want me to justify my statement? Look at this amazing picture of Rava Idli here. So I was not worried I had a delicious idli in mind a whole grain one but the thing needs rice so I decided to substitute with quinoa. And the idli flopped miserably to add to hubby’s woes I forgot to add salt to the batter. That is the time when hubby said please do not mess around with idli. Then I made another poha idli that really was a gooey mess. He was teasing me calling it idli fudge but he ate it. Looking at him I too quietly ate it. It did not taste bad only appearances was a mess. Now I knew I was in serious trouble if I wanted to participate in the idly medley(as if Ithat is an option). I tried one small plate of instant Poha idli from this place and loved it. But since the theme condition said no rice I made a second one with Bombay rava. Needless to say, the rice rava one was fantastic but no pictures. Since tomorrow Hubby has to go in for an angiogram I have no time to redo and add pictures. I will update the post with round idlis hopefully after his procedure. Instant Poha idli is simple to make yet delicious and filling for those days when nothing goes right. In a sieve add the poha and wash it under running water till the water runs clear. Transfer to a medium sized bowl and add the curds and the rava and give it a good mix. Add a teaspoon or 2 of water if the mixture is too dry. After about 5 to 10 minutes run the immersion blender or transfer to a mixer jar and grind till the mixture is a fine homogenous mixture. Use a little water if needed. Transfer back to the same bowl if you have used the mixer jar. Add salt and mix well. Get the cooker ready by adding sufficient water in the base and start heating the water. Remember to remove the valve/weight from the cooker lid. Add water, if needed, to make a thick dropping consistency. Grease the idli mould with ghee, oil and add the batter in the mould. Once the water is boiling rapidly place the idli stand in the cooker. Cover with the lid. Steam the idli only for 10 - 12 minutes. Do not overcook the idlis. Once you remove the idlis from the cooker let it stand for 2 minutes. Remove to a bowl or directly to a plate. Serve it with spicy chutney and sambar. You can also use a greased plate like I have to make your idlis. To make things interesting for a child then use a cookie cutter to cut the idlis. Poha| Avalakki| beaten rice can be any variety thin, thick or medium. I generally stock the thick kind. I do make the rava idli butnever added poha to it. Next time will try your version. Loved the shape ! 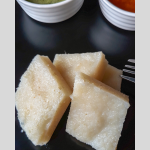 Flatten rice and rawa idli wow bookmaking it to try soon. This idli sounds more healthy. Loved this thali idli. Pictures are so beautiful so no need to change. Loved it. The idlis look awesome! They are so soft, and I’m sure they were delicious. Got to try this recipe out soon. I love how you’ve gone to great lengths to make rice free idlis. I truly love your spirit Archana. As for the shape of the idli, where does it say it has to be round. I’m good to try this poha idli when I get back home.Such an easy recipe to take care of hungry mouths early in the morning. Please do try and share with me your experience Mayuri. And thanks you have made my day. Love this different shaped idli 🙂 Most of the time I love these soft kind of idli using poha.. Lovely share ! Thanks, Swati. Bombay rava is fine rava but thicker than Chirooti rava. Have I made it easy or complicated the matter? Poha Idli looks so good.I am always looking for instant recipes.This seems so good.Awesome share Archana. 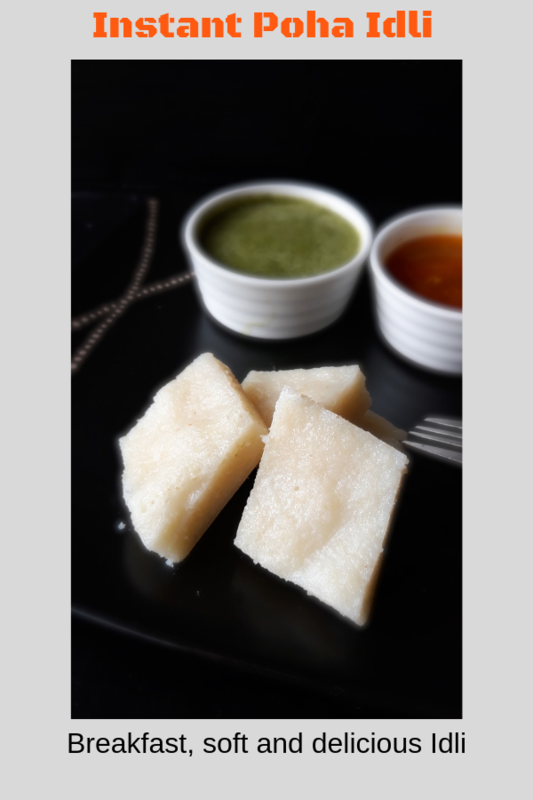 the diamond shaped idli has my attention, ARchana 🙂 I can hopefully turnaround the idli hater at home (the elder one) with these cute, healthy shaped ones ! 😀 hope you do Kal.